The hooking of a whopper will make even the most experienced of fishermen shake with excitement. 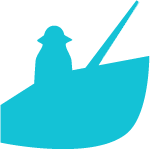 This programme can be implemented during the period 1 June – 31 August, when salmon fishing is permitted. Fishing is forbidden from Sunday at 7 p.m. through to Monday 7 p.m. 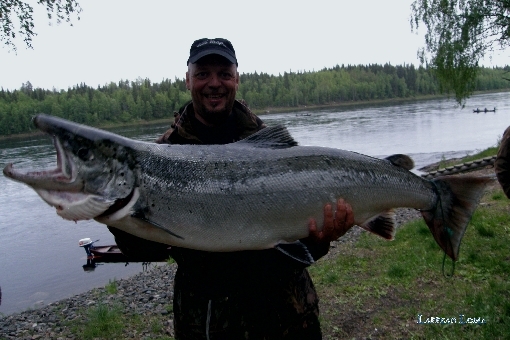 In the salmon trolling course arranged at Lappean Suvanto you will learn the best salmon fishing spots, hear hints as to the best lures to use, and fully explore the secrets of salmon trolling with the help of the experienced fishing guide. The price of the trip includes the services of the guide, fully-fitted salmon fishing boat for the duration of the course, flotation jackets and fishing gear. PLEASE NOTE! This trip does not include fishing permits. Coffee and biscuits are served in the LappeanLohi cafeteria. The boat capacity is one plus guide.